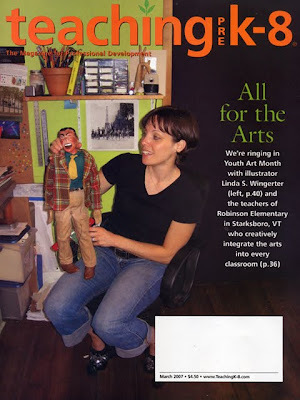 Linda S. Wingerter began learning about art, puppet mechanics and performance while growing up in her family’s New Jersey puppet theater, The Stringpullers. Linda studied illustration at the Rhode Island School of Design and spent her junior year in Rome with the European Honors Program. Since graduating in 1996 her illustrations have been seen in computer programs, opera posters and children’s magazines such as Weekly Reader and Cricket. Her seven award winning children’s books include One Grain of Sand, by Pete Seeger. Her paintings have been exhibited at the Eric Carle Picture Book Museum and the White House. From 2004-07 Linda apprenticed with Puppetsweat Theater, assisting Leslie Weinberg with puppet construction and performing under the direction of Robert Bresnick in shows all over the east coast including Master Peter’s Puppet Show at the Kennedy Center. She was a puppet artist in residence at Wesleyan University in 2005, and was Project Manager of the Liz Lerman Dance Exchange’s epic community performance cycle 613 Radical Acts of Prayer for the International Festival of Arts & Ideas in 2008. 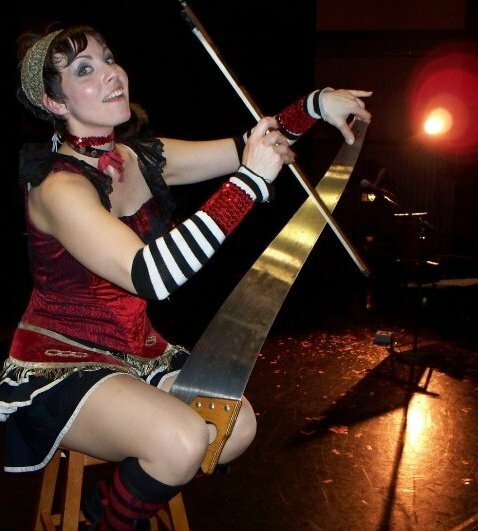 Linda is known in Connecticut as a multi-talented vaudeville artist, incorporating fire, visual arts, dance, roller skating, musical saw and circus skills into her eclectic performances. 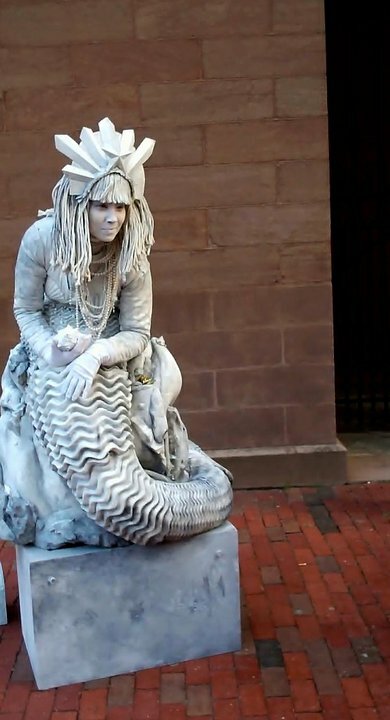 Her acts have been featured in the Forgot to Laugh Side Show & Animation Festival, Hartford First Night, the Ideat Village Art Festival, Honk Fest, and in venues from the Mohegan Sun Casino to the Coney Island boardwalk. Her unusual talents have appeared in shows such as Hamlet (Elm Shakespeare Company), Terra Mirabila (Projects 2K), A Midsummer Night’s Dream (New Haven Theater Company), VaudeVillain (Broken Umbrella Theater Company), Radical Derby (International Festival of Arts & Ideas), and The Servant of Two Masters (Hamden Hall School) for which she was also choreographer and resident circus instructor. Linda is the founder of many community projects such as the thriving New Haven Circus Collective, a roller derby coach, a teacher of puppetry at Quinnipiac University, an art teacher at Common Ground Summer Ecology Camp, and a staff member of the Costume Department at the Yale School of Drama. 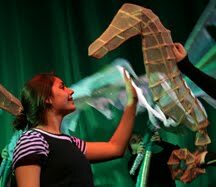 Linda has worked with Cornerstone Playhouse for 10 years as a stage manager, costume designer and scenic artist. See more of Linda's work at www.paintedbooks.com. 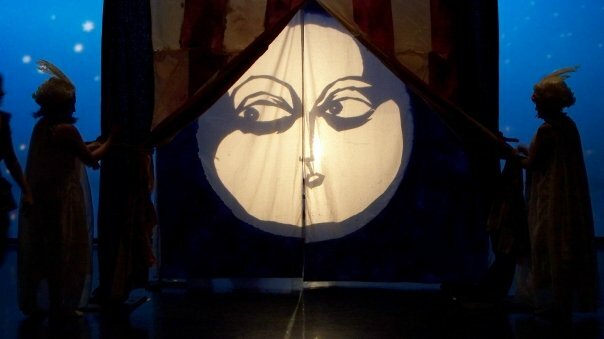 Shadow puppetry and dancers in Linda's "Polly & The Moon" at the Forgot to Laugh Festival. Linda as the Mermaid Statue at Hartford First Night.